Theresa May has effectively challenged Jeremy Corbyn to call a parliamentary vote of no confidence in her government. The Labour leader last night attempted to force Mrs May to accept a vote of no confidence in her leadership – a move which would have been symbolic, but carry no official weight. But last night Downing Street sources dismissed the plan as a “silly political stunt” and instead challenged Mr Corbyn to call a full vote of no confidence in the government. If passed, it could lead to the collapse of the government and ultimately a general election. Last night a Downing Street source said: “There is a method under the Fixed Term Parliament Act if MPs want to express no confidence in the government. The high-risk move came after Brexiteer Tory MPs – who just last week attempted to have Mrs May removed as prime minister – said that they would back her in any parliamentary no-confidence vote. Mrs May is also assured of the support of the Democratic Unionist Party – which she relies on for a parliamentary majority. Nigel Dodds, the deputy leader of the DUP, said: “We are not interested in parliamentary antics or play-acting of the Labour Party. Instead the pressure is now on Mr Corbyn who for weeks has ignored calls by his own MPs and shadow Cabinet colleagues to try to bring down Mrs May’s government. The Labour leader yesterday laid a confidence motion before MPs at the 11th hour after the prime minister announced that her meaningful vote will now be held in the week starting January 14 rather than before Christmas as Labour MPs had demanded. The government had been poised last night to announce that it would make time for the vote in the Commons. However it decided not to do so after some of the other opposition parties tabled an amendment which would have made Labour’s amendment a full-blown motion of no-confidence. Mr Corbyn’s attempt to hold a non-binding vote was pitched as a proposal which would not prompt a general election or government collapse and therefore be appealing to Tory MPs who had simply lost faith in Mrs May’s leadership. The decision to allow the vote was in the gift of the government and Labour sources said that if they refused he would move to a full vote of no confidence in the government. But it began to backfire when the Scottish National Party – usually firm critics of Mrs May – questioned his wisdom. Mrs May’s allies believe winning any vote could provide a significant boost to her authority in the run-up to Christmas after more than 117 Tory MPs voted for her to go last week. Labour announced shortly before 3pm that Mr Corbyn was planning to table a motion of no confidence if the prime minister failed to name a date. However minutes later the prime minister stood in the Commons and announced that the vote will be held in the week beginning January 14, with debates the week before. Mr Corbyn did not issue his motion when he spoke at 3.45pm, and Labour claimed victory on social media that the threat alone had been enough to secure a date. 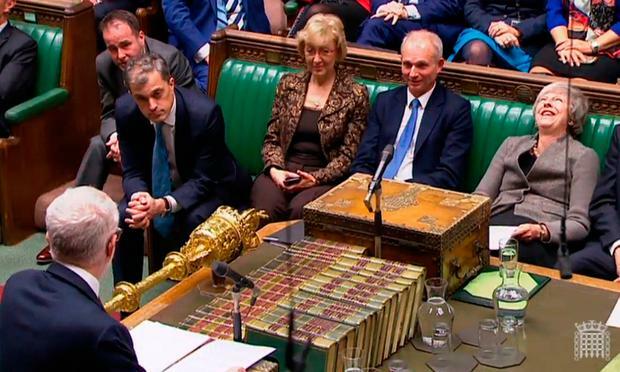 However just two hours later Mr Corbyn returned to the Commons to table his motion, with sources saying he had changed his mind after noting the “mood of the House”. The move almost immediately threatened to backfire. The SNP accused Mr Corbyn of “pathetic political cynicism” and insisted he get on with calling a proper vote of no confidence. It criticised Mr Corbyn for tabling a motion of no confidence in the prime minister directly, which made it non-binding, rather than the government. Steve Baker, a senior member of the European Research Group of Eurosceptic Tory MPs, said that they would back the prime minister. He said: “Eurosceptic Conservatives are clear that we accept the democratic vote decision of our party to have confidence in Theresa May as PM. We will vote against Labour in any confidence motion.” The Cabinet will today be told that planning for a no-deal Brexit will be significantly bolstered, with other non-essential government business suspended.